This past weekend Marty was in full geeked-out triathlon mode. This entailed riding his bike with a few other OSB’ers to Wilmington (121 miles), and then ‘Swimming the Loop’ which is a 3.5 mile open water swim on Sunday. This left me and Junior Awesome to our own devices. We kissed dada good-bye early Saturday morning and headed over to Morrisville (next town over) to run in a very small 5K they were having. I decided on Thursday to do this mainly just to give us something to do in the morning. Kari conveniently lives about a half mile from the start, so we parked there and all 3 of us jogged over. I hardly ever push Logan in the stroller to run. Marty pushes him exclusively when we go together, and I’ve only gone by myself with him just a handful of times. I just don’t really like it – it messes with my stride and my posture and I’m not very comfortable pushing him. I’m also very slow when I do push him. At least once when Marty and I ran together I started off pushing and Marty said after just a few minutes, “ummm, just let me do it.” He’s got the movement down and can get going quite well. 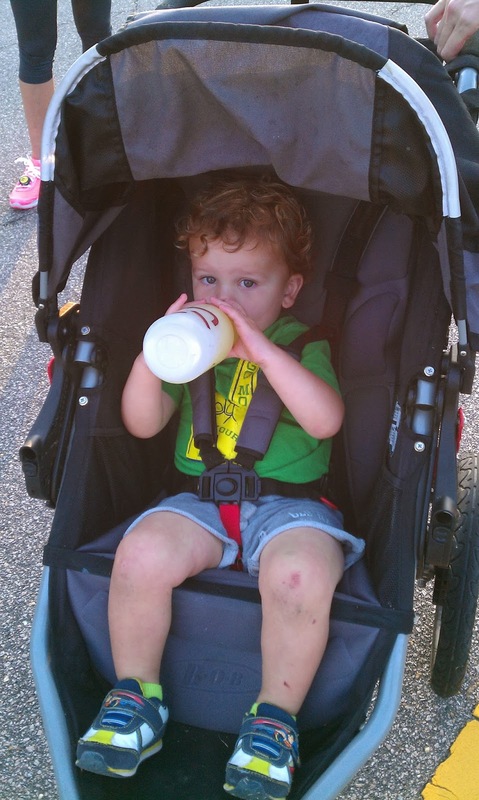 For those of you that are local, he has no problem pushing Logan through the Turkey Creek loop at Umstead. So I really had no idea how this 5K was going to go, but I figured it would be a good workout. The course, luckily, was fairly straight, just all the way down the main drag and then a u-turn to head back. Less turns was good for me pushing that thing. Unfortunately, the whole way down was a slight decline, so you can figure out through deductive reasoning what the way back was like. And any incline pushing the stroller (25lbs) plus kid (30lbs) is tough. I started off conservatively, and tried to get in a rhythm with a one arm swing. I switched arms a few times but holding on with my left and swinging my right was too weird. The first mile was nice since it was pretty much flat/downhill. As usual, people went off pretty quick, so I got to pass others almost the whole time. I slowed way down at the turn around trying to maneuver the stroller. But then we got back up to speed. Logan helpfully pointed out dogs, trucks and cars along the way. I was comfortably in 3rd place for women almost the entire race, and moved up to run next to the 2nd place guy towards the end, but he put in a late surge that we couldn’t match. 21:07, 3rd woman, 5th overall. The race cost $25 and I won a $25 gift card so we ended the morning up 2 bananas. The rest of the day was filled with much park playing and eating and napping. We were going to cap off the night with a trip to Chik-fil-A, but a bar & grill caught my eye as I was almost into the parking lot so instead we watched football and mama had a beer. I can't run with my left hand holding the stroller either. It just feels terrible. And aren't those tunnels at the park tiny? Couldn't they have made them a bit bigger in anticipation of parents having to get thru them?